I absolutely love kabocha squash, but hate how it can feel like a lot of work to prepare. It is such a hard squash and so difficult to cut through. There is a better way!!! I did a Pinterest search and discovered that you can cook squash in the slow cooker WHOLE! How fantastic is that? 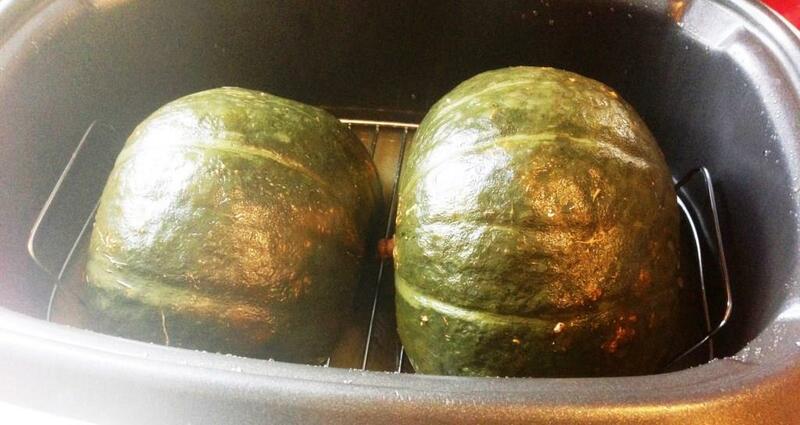 Today I used my cleaver and cut the kabocha squash I had in half because it was too tall for my slow cooker. I then scraped out the seeds since I already had access to them, placed them on a metal grate open-side down, poured 1 cup of broth into the slow cooker and set it on high for 1-2 hours or low for 3-4. Done! I have also cooked a smaller kabocha squash whole and it worked great as well. I am excited to try spaghetti squash next. * Make sure you test your squash along the way to make sure it is done to your liking. Each slow cooker operates differently (some run hot), so this way you can avoid a soggy mess. San-J is a favorite brand in this gluten-free Asian household. Their Thai Peanut Sauce has been a staple in our fridge for years as has their Szechuan Sauce & Terriyaki Sauce. While admittedly HIGH in sodium, I am a fan of these dressings. I used them on seaweed salad and to lightly marinade some cucumbers (they tasted best after only marinading 30 minutes…when left overnight they became too salty). I did however cut the dressing with a bit of rice wine vinegar because I like a more “vinegar-y” dressing and I also added some red pepper flakes to the cucumbers. Using the dressings on a regular salad produced a great result. 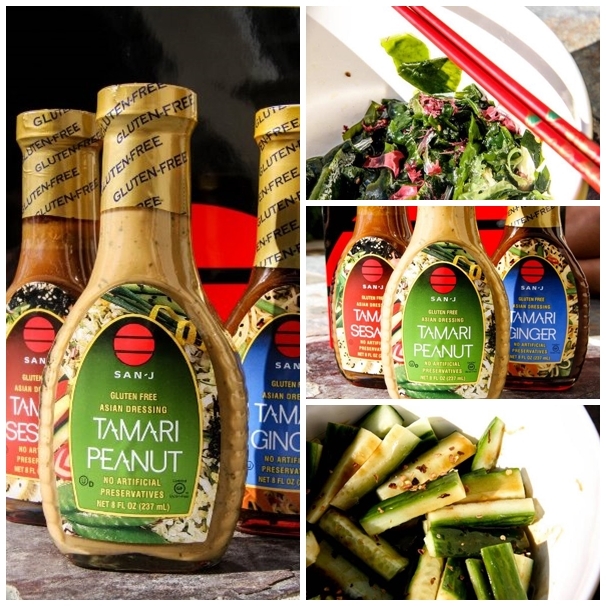 My favorite 2 dressings were the Tamari Peanut and Tamari Ginger since they had more flavor than the Tamari Sesame. Some more good news…San-J has Reduced Sodium Tamari now…yay!!! HOPEFULLY they will come out with Reduced Sodium Travel Packs soon (I keep the travel packs in my car for when I go out to Asian restaurants). Cook the spaghetti according to package directions. Then, drain and return to the pot. Meanwhile, heat olive oil in a large skillet over medium heat (eliminate if water sauteing). Add the zucchini; cook for 5 minutes or until tender. Add white beans, garlic, sea salt, pepper and crushed red pepper; cook for another 4 minutes. Remove from heat; add bean mixture to the spaghetti along with San-J Tamari Peanut Salad Dressing and mix well to combine. 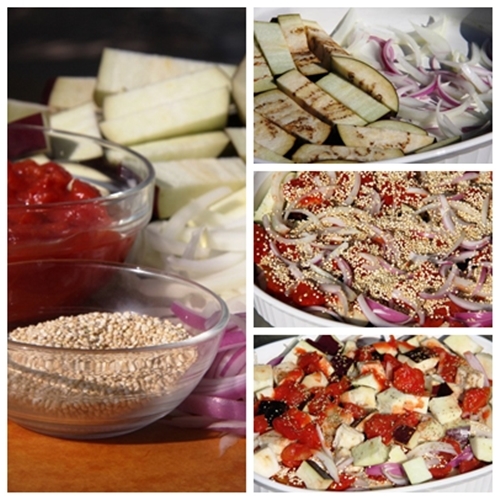 Serve warm and top with sesame seeds. My family and I had a wonderful holiday and I hope you did as well. We were able to have a laid-back Christmas at home and then left the next day to visit my sister and her family in the mountains for a white post-Christmas and New Years celebration. Good people, good times. I was motivated to not stray from healthy eating by the fact that I had a Swimspot.com 2013 swimsuit trends video shoot on January 8th (at a gorgeous private home on the water side of PCH in Laguna Beach…spectacular view!). Let’s just say that cookies and candies don’t look as appealing when you know you will be on display wearing a slew of swimsuits shortly after the holidays. In preparation for the shoot I ate my fill of fruits and veggies and stayed away from processed foods, grains, and legumes. 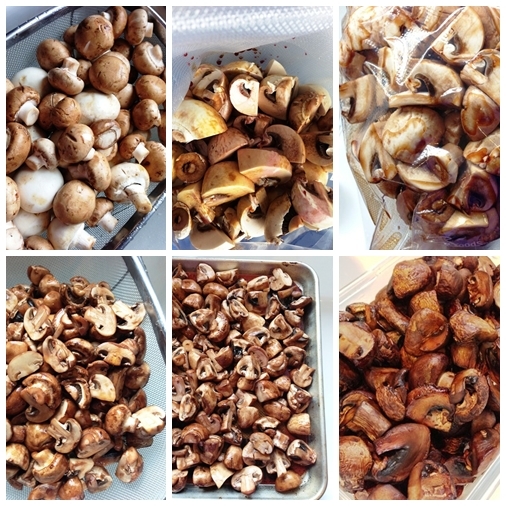 I ate a ton of roasted mushrooms because quickly add substance and heft to meals. It was my habit to make a huge batch at the beginning of the week and it usually lasted me 5 days or so. One of my favorite meals lately has been a water saute of onions and cabbage over roasted kabocha squash topped with roasted mushrooms and low sodium tamari or a spicy Asian sauce…yum! 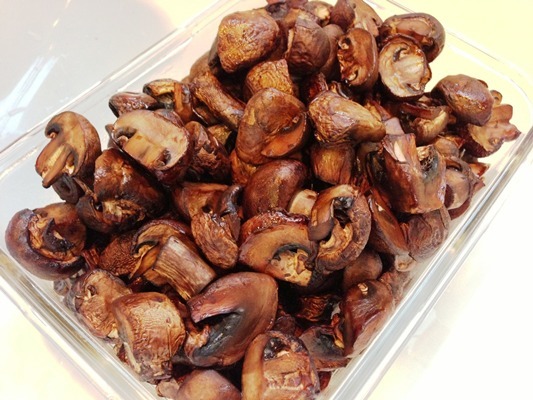 Place the drained marinated mushrooms on a baking sheet and bake for 45-50 minutes (stirring a few times along the way) until all of the liquid has baked off (be careful not to burn). I know we are all in the market for fast dinners. When I was little I would get so excited when my parents would announce that dinner was going to be grilled cheese sandwiches and tomato soup. My parents probably thought they were making a cop-out dinner, but I seriously loved it. Those dinners cemented the relationship between tomato soup and grilled cheese sandwiches in my mind. The other day my son announced that he wanted a grilled cheese sandwich for dinner. We were short on time and in all honestly I hadn’t given dinner much thought that day, so I went along with the plan. When trying to figure out how to round-out the quick meal, tomato soup popped to mind, however we didn’t have any on hand. 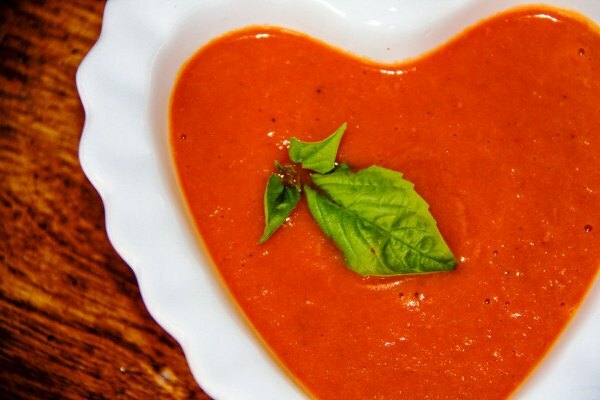 I have tried so many tomato soups through the years and most of them are too sweet in my opinion OR they have cream / milk in them. Well…necessity is the mother of invention, so I popped into my pantry and came-out with a jar of pasta sauce, a can of navy beans, and some broth. In the time it took for the Daiya grilled cheese sandwiches to brown, semi-home made tomato soup was on the table as well. 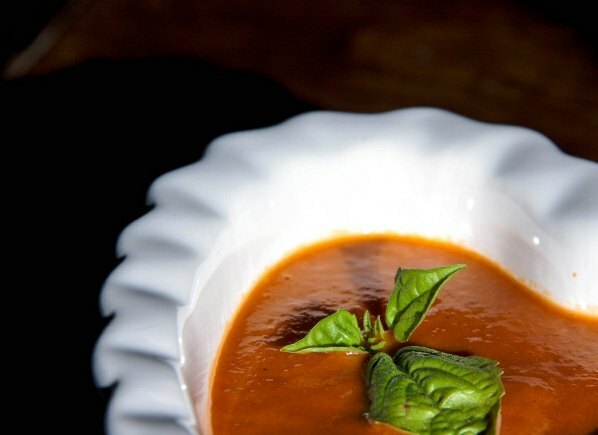 And there you have it…a fast, healthy, tasty tomato soup that courtesy of the beans is packed with fiber and protein. 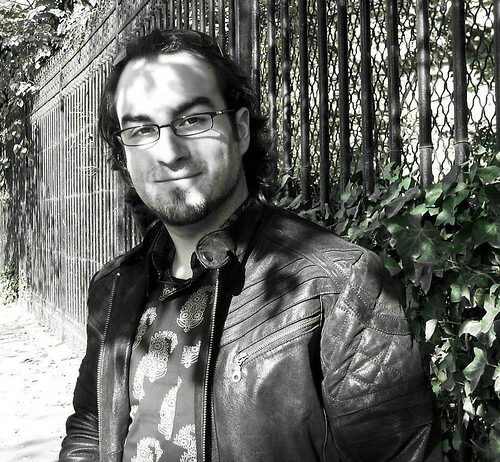 “My childhood in Sicily was spent splattering colors or sketching on anything at hand and getting dirty with clay or gypsum. Soon though, TV chefs motivated me to take advantage of the free kitchen in those few afternoons that I was left alone at home. I can still remember the first gooey meringues I prepared; perched on top of a silver presentoir, over a delicately embroidered white linen napkin, they waited on the kitchen table for my parents’ return, a token of gratitude for what they did and will be doing for me. 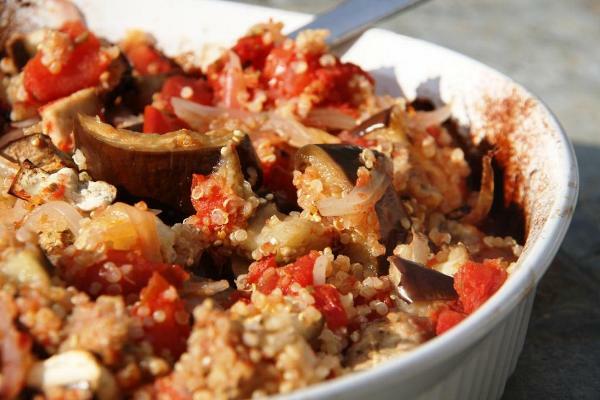 I really like eggplant and am always looking for new ways to prepare it. I made the recipe according to the instructions below from The Recipe Taster’s website, with the exception of the olive oil. I used the tiniest amount to grease the bottom of the casserole and did not drizzle any more oil onto the casserole. What resulted was a casserole which was a bit dry looking on top after baking, but that was easily remedied by mixing the casserole prior to serving…you won’t even miss the oil and your heart will thank you! Set your oven to 200C/390F and while it is eating up prepare the vegetables. Trim the stem and flower ends from the eggplants and cut them into 3-4 drums across their length. Lay the drums cut side down and cut them vertically into planks about 5 mm/1/5″ thick and set aside. Peel the onions, cut them in half and then into slices about 3mm/1/10″ thick. To build the casserole, chose an oven-proof dish that could accommodate the ingredients in at least 2 layers. Grease the bottom of the dish with about 1/2 tablespoon extra-virgin olive oil (I used about 1/2 of that), place some of the onions on it followed by the eggplants (if the pieces are too wide to fit in, tear them in halves using your hands). 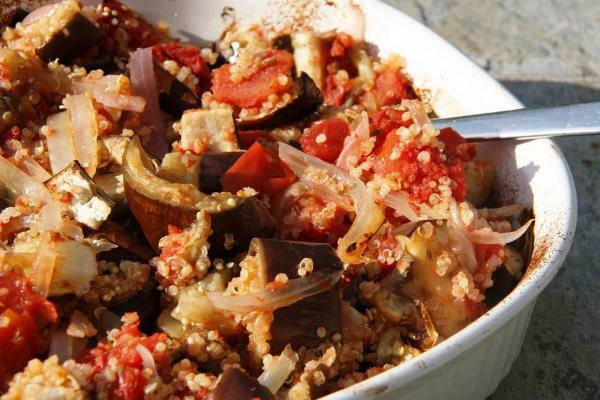 Sprinkle the eggplants with some of the quinoa and salt. Add a pinch of oregano, red pepper flakes (if using). Cover with some of the tomato pieces. Continue layering the ingredients as described until either the oven dish is filled up or the ingredients run out. Finish the casserole with a layer of onions a sprinkle of salt and a drizzle of extra virgin olive oil. 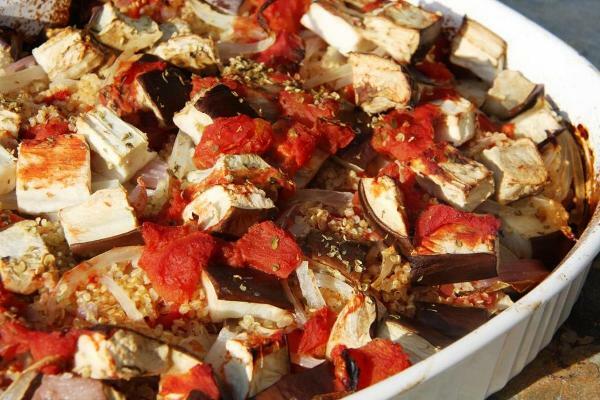 Pour the white wine over the vegetables and bake the casserole for about 1h-1h30m or until cooked through. 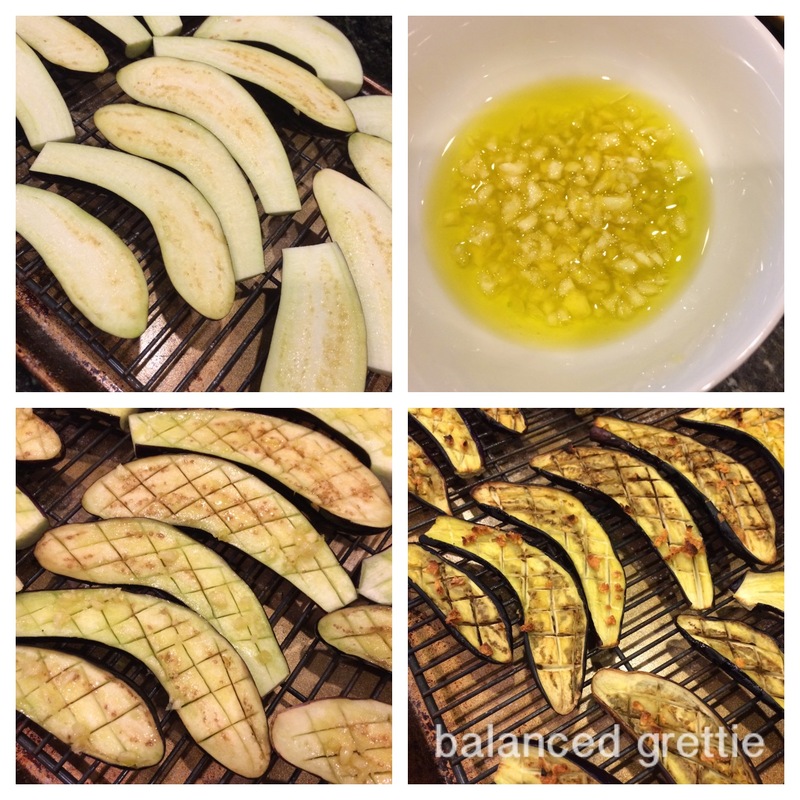 To test for doneness try a piece of eggplant, it should still retain some bite but must be cooked through. Check the casserole every now and then and if the top is browning too fast, cover it with a piece of aluminum foil. Let the casserole cool down a bit before serving since it will be boiling hot. Coincidentally, this dish is great even served at room temperature. I am super excited about today’s guest post by Catherine McCord of Weelicious…this marks her third guest post for Veggie Grettie (click HERE for her first and HERE for her second). I can’t wait to make this recipe. The carrots I have been buying at the Farmer’s Market right now are so sweet and flavorful, so I know this is going to be amazing. Enjoy!!! When it comes to my kids, if they’re offered rice or pasta they pretty much could care less what its mixed with. 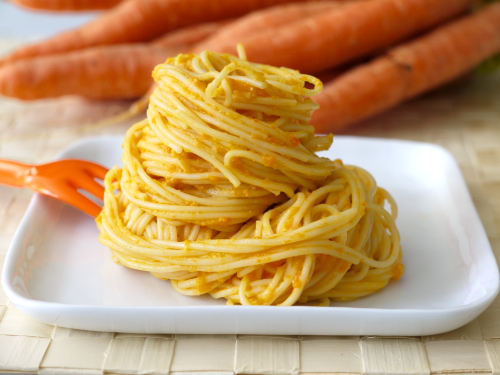 But when I served this Carrot Ginger Sauce tossed with long strands of noodles they were dubious. What was this “orange pasta” sitting on their plates? That initial skepticism changed almost immediately after their first bites. With sweetness from the carrots, salty flavor from the miso and nuttiness from the tahini, they were so hooked by the incredible taste, I think they’re going to start paying a lot more attention to what’s on their pasta and rice from now on! 1. Heat oil in a sauté pan over medium heat. 2. Add garlic and sauté until soft, about 30 seconds. 3. Add ginger and carrots. 4. Cover and cook until carrots are soft, about 15 minutes. 5. Transfer to a food processor and add the miso, tahini and water. 7. Serve tossed with pasta, soba, udon noodles or rice. * Stays fresh in the refrigerator for 3-4 days. I couldn’t for the life of me come-up with an interesting name for this meal, but that doesn’t mean that this meal doesn’t rock…because it does. This salad in a pepper bowl covers all the bases; protein, complex carbs, and vitamins galore not to mention the fact that you eat the bowl…no dishes!!! A few weeks ago I was talking to my daughter’s Kindergarten teacher after school about food and recipes…an almost daily occurance between the two of us (my daughter knows to keep playing when we get on the subject of food, because we are GUARANTEED to be there for a long while) and she mentioned that the last time she was at Trader Joe’s they made a yummy salad by mixing together pre-cooked lentils and bruschetta. Um, yum! I think I might be single-handedly responsible for purchasing all of Trader Joe’s bruschetta. While I can make my own, this product has saved me so much time and the flavor is amazing. What is NOT amazing is the amount of olive oil they add to it. Rest-assured, I have a solution for this problem. When I buy the bruschetta I put it in the coldest part of my fridge for a day and all of the olive oil floats to the top and solidifies a bit making it quite easy to skim-off and throw in the trash can (better the trash can than my arteries!). I have been eating this like crazy and it is now a staple in my fridge. I took the liberty of adding some rice to the salad and really enjoy the results. 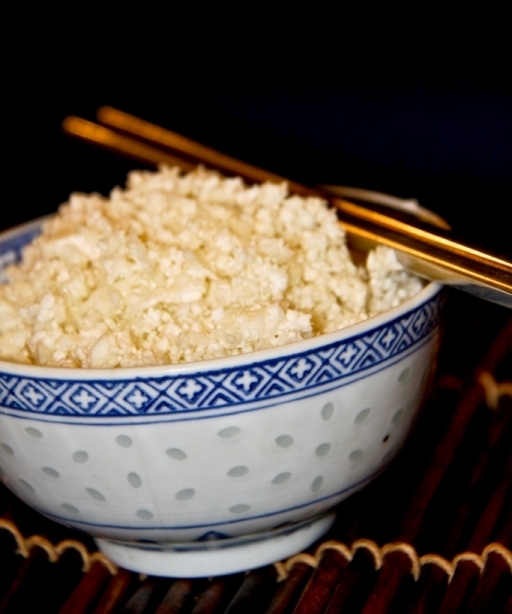 Cook the frozen rice by placing it in a glass bowl (NOT in the plastic as the directions suggest) and microwaving for 2-3 minutes. Mix together the rice, lentils, and bruschetta (including all of the juice). Cut the top off of a bell pepper and remove the seeds. 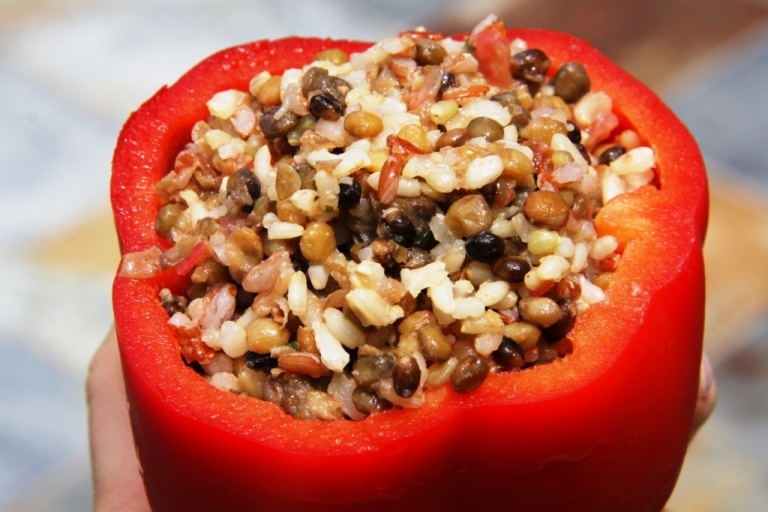 Spoon the lentil salad into the prepared bell pepper and enjoy! I am so excited that the Spork Sisters are guest posting today! I met Heather and Jenny at the Natural Products Expo West and they were as sweet as could be, but what really won me over was the amazing food they were serving. In a land of sample aplenty, their food stood out and was wonderfully flavorful. If this is your first introduction to the Spork Sisters, take note. 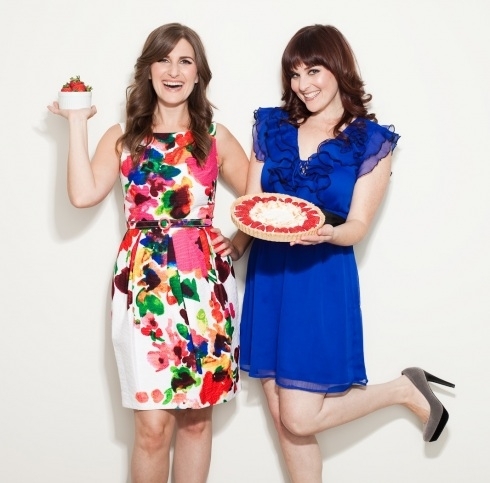 The ladies just released their first cookbook (Spork-Fed) and I can’t wait to get my hands on it. For some time now the ladies have been teaching cooking classes in LA to rave reviews. For those of you who can’t get to LA, they now have online cooking classes. I highly recommend checking out their site and learning more about the awesome duo (click HERE). The following recipe is from their cookbook, Spork-Fed with a foreword by fellow fans and sisters, Emily and Zooey Deschanel. INTRO: These lil’ fritters are special! They get a lot of their essence from lemongrass, one of the most important flavors of Thai and Vietnamese cuisine. 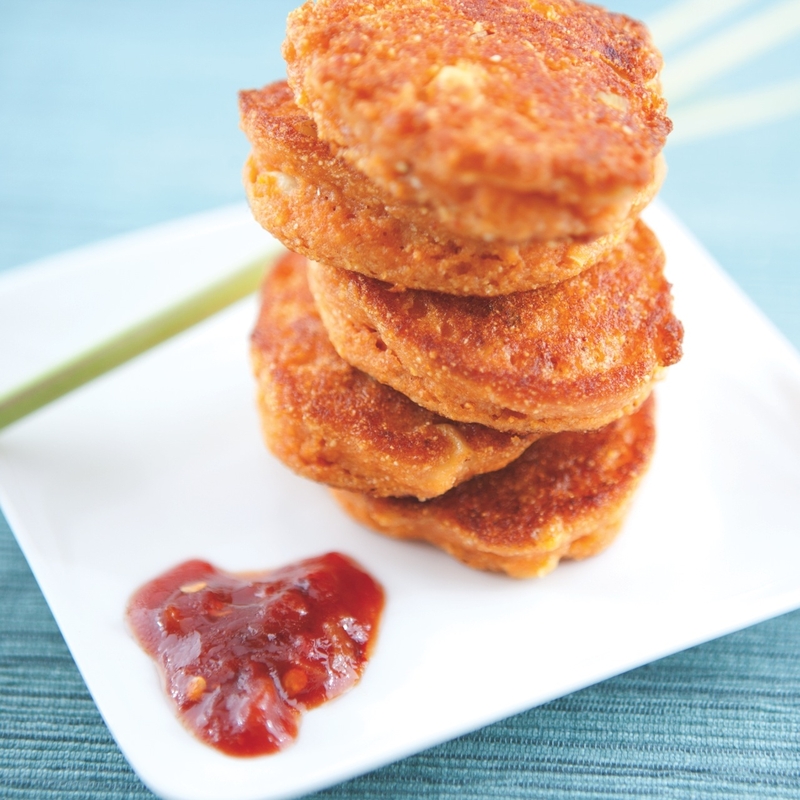 Just the smell of these fritters cooking will attract attention from neighbors all around. When you make a Southeast Asian feast, be sure these are part of the menu. In a medium bowl, combine 2/3 cup cornmeal, rice flour and baking powder. Whisk until uniform. Add maple syrup, oil, lime juice, tamari, chili paste, ginger and sea salt, and whisk. Add corn, lemongrass and water to mixture. Amount of water needed will vary, depending on which brand of rice flour is used. Consistency should be fairly firm and mixture should hold together when scooped. Form mixture into 2-inch round patties. Add additional cornmeal to a bowl and coat patties. Tap patties gently to remove excess cornmeal. Heat a large sauté pan and add high-heat oil. Place patties in pan and cook over low-medium heat for about 3-5 minutes on each side, until golden. Note: You can double the recipe when serving more than four. For a printable version of this recipe click here. FOR YOUR SMARTS Lemongrass is native to Southeast Asia and has been consumed and used as medicine for thousands of years! Lemongrass is a general term for about 55 species of grasses. Some types are used in perfumes and cosmetics because of the clean, fresh smell. FOR YOUR PARTS Lime juice contains a compound called limonene, which is a major cancer fighter! It can also boost your white blood cell activity. That’s some powerful citrus! 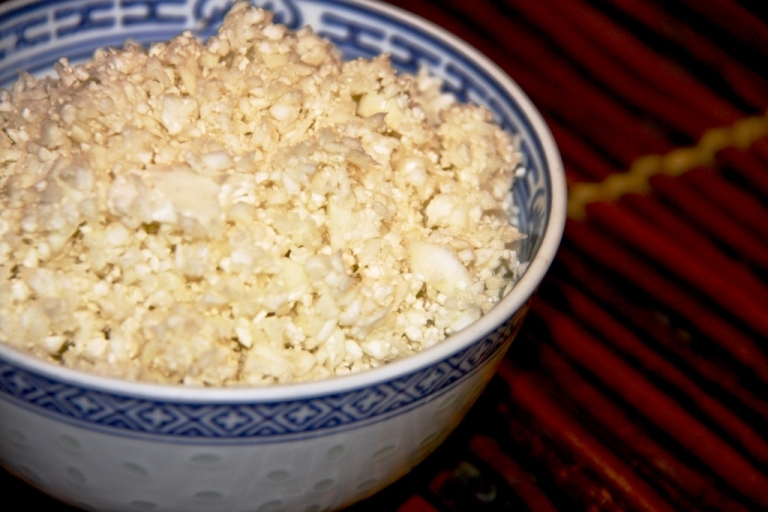 I had been meaning to try cauliflower rice for a long time. I know people who follow the Paleo Diet swear by it, so a few days ago I FINALLY tried it. The verdict? I like it. 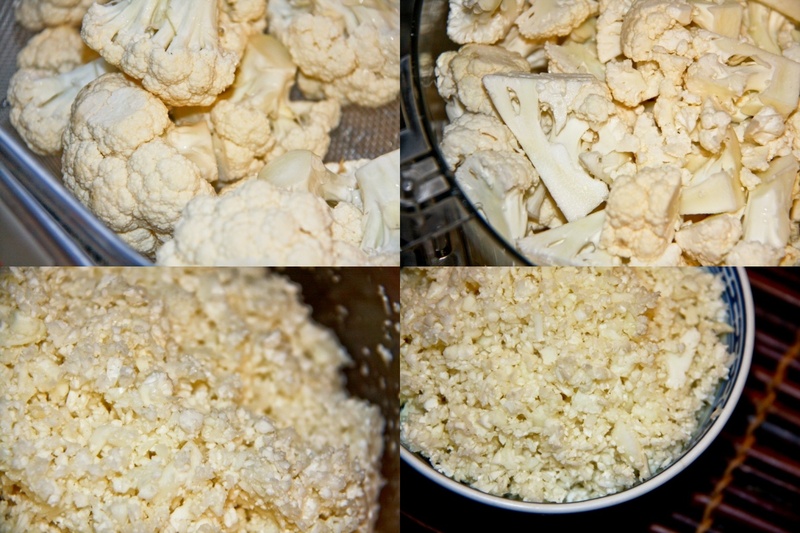 I took a head of organic cauliflower, chopped it up, and put it in the food processor (If the head of cauliflower is large, you may have to process it in two batches). I “pulsed” it until it resembled the texture of rice and it was done. Simple. When dinner time rolled around I put the stir-fry I made over the raw cauliflower rice and it was surprisingly good. In the next few days I plan on trying to make my stand-by fried rice recipe with the cauliflower rice to see how it turns out. I don’t want the “rice” to get mushy, so I don’t plan on cooking it long at all.